Staff Selection Commission conducted Multi Tasking (Non-Technical) Staff (Paper-I) Examination, 2016 from 16-09-2017 to 31-10-2017 in the Computer Based Mode. ** As per the Notice of Examination, candidates for each State/ UT will be finally selected based on their performance in Paper-I, subject to their meeting basic qualifying standards fixed in Paper-II. Next screen will be opened. then click on “click here” option the PDF file will be opened. You can find your Roll Number or Name in that PDF List. *Includes 169 SC, 72 ST and 1627 OBC candidates qualifying as per UR standard. **Includes 31 SC, 03 ST, 288 OBC and 509 UR category candidates. ^Includes 08 SC, 51 OBC and 39 UR category candidates. ^^Includes 04 SC, 31 OBC and 28 UR category candidates. ^^^Includes 03 SC, 23 OBC and 25 UR category candidates. 1. For preparation of the final Result, Category and State Code of candidates have been taken from the Online Verified Data. 2. 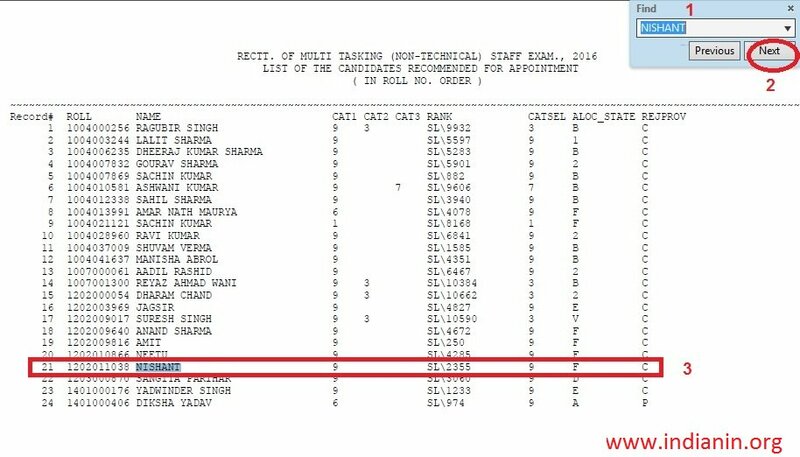 Candidates selected against Horizontal vacancies have been shown in their vertical categories as well. 3. Rows corresponding to Posts and Categories with ‘Nil’ reported vacancies, have not been included in the table. 4. Paper-II is qualifying in nature. (1) By referring to the marks in Part-III i.e. General English of the Objective Type Paper. (2) By referring to marks in Part-II i.e. Numeric Aptitude of the Objective Type Paper. (3) Date of birth i.e. the candidate older in age gets preference. (4) By referring to the alphabetical order of the names taking first name into consideration.